Aero 13 was set up by two friends in July 2001, and is a fast-growing company specialized in aeronautic sheet metal work, aircraft parts repair and precision machining. Our ability to understand our customer's needs, especially by provinding our employees to your production sites, is the base of our growth strategy. 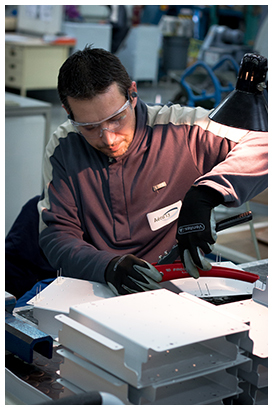 Thanks to our production means and our know-how, we are providing a whole range of services : manufacturing simple and complex parts, production of subassemblies and complex subsets, production of mechanical elements through various processes and aeronautics repair workshop in our productions sites or customer's site. By fully playing our role as partner, Aéro 13 support your success. Our goal : be at your sides and answer your request without delay.